One of my filer was hit hard by rt 639665 last night. Would you be kind enough to share your idea to prevent this burt, even a work around before DOT 8.2 release? Thanks in advance & looking forward to hear from you. there is NO info about this burt. Did someone tell you that you ve been hit by this burt? Also, if there is no info about it its likely to be under investigation. once there is more info you should be given a workaround, if there is one. Told me that the Burt will be fixed in DOT 8.2X2. Any idea when this DOT 8.2X2 will be released? 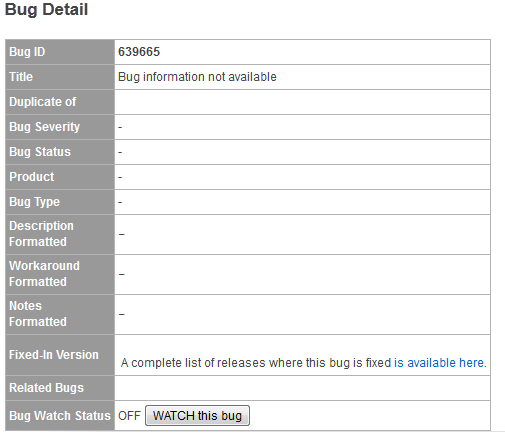 What is a description of the issue since an internal bug? Still trying to find a work around before DOT 8.2X2 release. I know this thread is old, but we've hit this BURT twice. Each time when we've upgraded per NA it still bit us. This was a big issue for us due to the total outage for the effected SVM. The last time it hit us we were running DOT C-Mode 8.1.4P1. We just upgraded to 8.2.1P2. I'm curious if you're there now and have been monitoring the CLAM heartbeat since. If so is it normal? I'm twice bitten and very uneasy on it. I hear more resiliency is even being put in 8.3 so maybe it is behind us. Last, did NA specifically provide a RCA on what actually caused the failed heartbeats?